Are you sure your patient has a brain abscess? What are the typical findings for this disease? Brain abscess is a focal suppurative process of the brain parenchyma.The abscess begins initially as an area of focal inflammation, called cerebritis, which with time and without effective treatment progresses to an abscess. Brain abscesses usually develop in a four-stage process. These stages are early and late cerebritis (days 1-3 and 4-9, respectively) and early and late capsule formation (days 10-13 and day 14 and later, respectively) and represent a continuum rather than discrete steps. The evolution of this process is dependent on the causative organism, host immunologic status, and effective antimicrobial therapy. Brain abscess is uncommon in infants and children, but delays in diagnosis and treatment are associated with death and/or permanent neurologic deficits. It is therefore important to pay close attention to patients with underlying infection in the oropharynx, middle ear, and paranasal sinuses who present with mental status changes, focal neurologic deficits, or seizure. Brain imaging studies should be performed. Magnetic resonance imaging (MRI) with gadolinium contrast is more sensitive and specific than computed tomography (CT) with contrast. Clinical manifestations are dependent on the age of patient, the location and size of the brain abscess, the virulence of the causative microorganism, and host immune status. Headache, mental status changes, focal neurologic deficits, and fever are hallmark symptoms and signs of brain abscess. New-onset seizures can also be the initial symptom of brain abscess. 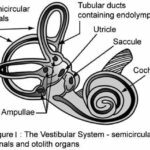 Nausea and vomiting, nuchal rigidity, and subtle focal deficits such as cranial nerve palsies can also occur. The sensitivity of the classic clinical triad of fever, headache, and focal neurologic deficits, however, has been variable. Neonates with brain abscess can present with only an enlarged head and subtle neurologic dysfunction. Some of the symptoms and signs of brain abscess can occur in patients with bacterial and viral meningitis. Patients with brain tumors and nonsuppurative complications of otic infection (e.g., otic hydrocephalus) can experience some of the symptoms and signs of brain abscess. 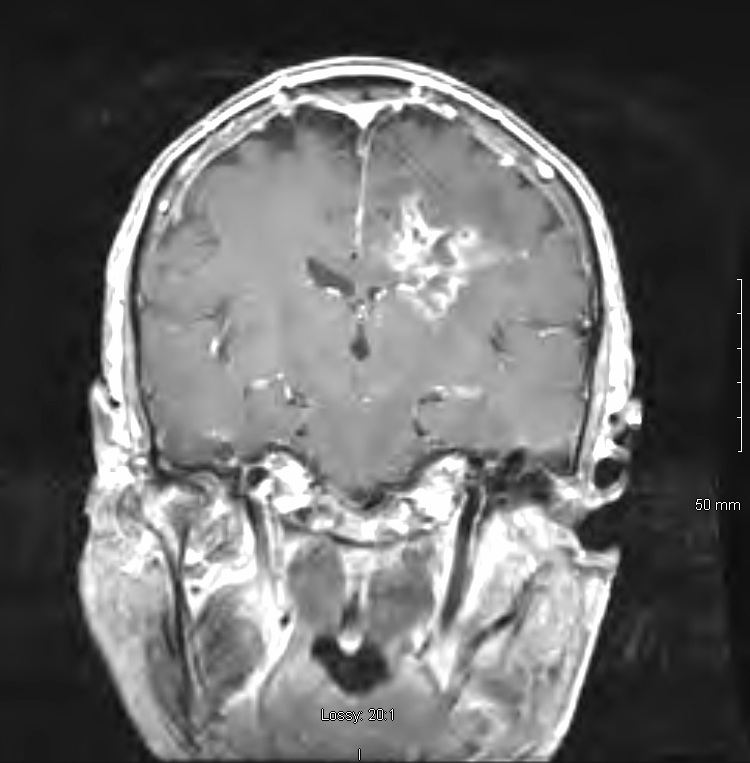 The diagnosis of brain abscess can be challenging in patients in whom a single ring-enhancing lesion with perifocal edema has been identified on CT, giving rise to the differential diagnosis of abscess versus necrotic tumor (glioblastoma) or metastasis. There are three major pathogenetic factors predisposing to brain abscess. 1. Contiguous spread: Brain abscesses most commonly are the result of contiguous spread of infection from the oropharynx (odontogenic), middle ear, and paranasal sinuses; direct extension; and, more commonly, retrograde thrombophlebitis through the valveless diploic veins. Brain abscesses are more common in children, adolescents, and young adults (7-20 years of age) than in other age groups because they are likely to have highly vascular diploic bone, which increases valveless bidirectional flow between frontal sinus mucosa and the dural venous drainage. 2. Cranial trauma. The prevalence of brain abscess after penetrating trauma or neurosurgical procedures ranges from 2%-14%. 3. Hematogenous spread from distant focus of infection: Hematogenous spread can occur in the setting of endocarditis, cardiac shunts, chronic pyogenic lung infection, intraabdominal abscess, and urinary tract infections. Hematogenous abscesses are usually multiple, are identified at the gray-white matter junction, and are located in the middle cerebral artery distribution. Once a diagnosis of brain abscess is considered after radiographic imaging, microbiologic diagnosis should be performed, including processing the samples for Gram stain and other stains if indicated (stain for fungal organisms and acid-fast bacilli) as well as obtaining cultures for both aerobic and anerobic organisms. A CT-guided stereotactic biopsy with aspiration of abscesses lessens the necessity for open craniotomy and can be both diagnostic and therapeutic. Lumbar puncture should be avoided in patients with known or suspected brain abscess because of low yield of microorganisms from cerebrospinal fluid and the risk of herniation. In patients with suspected meningitis, blood cultures should be obtained and an appropriate empirical antimicrobial therapy should be initiated, followed by an imaging procedure. The wide availability of imaging studies has improved the diagnosis of brain abscess. MRI with gadolinium contrast is more sensitive and specific than CT with contrast to diagnose brain abscess, but MRI is not as widely available, and it can be logistically challenging to obtain for the acutely ill patient. In contrast, CT is widely available for rapid assessment of hydrocephalus, mass lesions, hemorrhage, or acute brain edema before lumbar puncture. MR spectroscopy has also been used for the evaluation of brain abscess, but experiences are limited. Noncontrast MRI or CT results can be normal in early cases. Clinical manifestations vary depending on the age of the patient, the location and size of the brain abscess, the virulence of the causative microorganism, and host immune status. A high index of suspicion for brain abscess should exist for an infant with an enlarged head with or without neurologic deficits as well as for children with congenital heart disease or infection in the oropharynx, middle ear, and paranasal sinuses who present with seizure, focal neurologic deficits, or altered mental status. If you are able to confirm that the patient has a brain abscess, what treatment should be initiated? Treatment requires a multidisciplinary approach involving pediatric intensivists, neurosurgeons, radiologists, and infectious disease specialists. Understanding the pathogenesis is important in determining the most likely causative microorganisms and subsequent treatment. Empirical antimicrobial therapy should be started, particularly in patients with sepsis or impending herniation, but every effort should be made to obtain microbiologic and/or tissue diagnosis before initiating antimicrobial therapy. Because brain abscesses are frequently polymicrobial, empirical therapy should cover gram-positive, gram-negative, and anaerobic organisms, normally with a third- or fourth-generation cephalosporin (e.g., cetriaxone or cepefime, respectively), metroniazole, and vancomycin, based on predisposing factors and epidemiologic characterisitics. Carbapenems (e.g., meropenem) can be used in lieu of the combination of cephalosporins and metroniazole. Once a causative organism is identified, antimicrobial therapy can be tailored, but coverage of anaerobic organisms should be continued even in the absence of an anaerobic isolate when the underlying infection is in the upper and lower respiratory tract. Duration of antimicrobial therapy should be determined individually but is influenced by causative microorganisms, surgical treatment, response to treatment, and reduction in the size of the abscess. The optimal duration of therapy is usually at least 6-8 weeks of parenteral therapy for bacterial abscesses. Cerebral nocardiosis or actinomycosis may require a prolonged course of therapy (usually more than 12 months). Indications for closed drainage and aspiration versus open craniotomy are not established. However, open craniotomy or stereotactic aspiration is indicated for brain abscesses greater than 2.5 cm in diameter. Open craniotomy is also indicated for special situations, for example, a traumatic brain abscess to remove foreign material or bone chips, a cerebellar or brainstem abscess for posterior fossa craniotomy because of the potential for brain herniation resulting from the small volume of posterior fossa, and periventricular abscesses because of the risk of intraventricular rupture. Ventriculostomy placement is also indicated for significantly elevated intracranial pressure and/or hydrocephalus. Dexamethasone has been used for reducing intracranial pressure, especially in patients with impending brain herniation, but the benefit of dexamethasone in treatment of brain abscess remains unclear. Seizure is a common complication in patients with brain abscess, occurring in 13%-25% of cases, and an anticonvulsant should be prescribed to prevent seizure in early course of therapy. What are the possible outcomes of a brain abscess? Brain abscess is associated with considerable mortality and morbidity such as seizure and neurologic sequelae. Delays in diagnosis and treatment, focal neurologic deficits at admission, impaired host immunity, uncontrolled diabetes, and Glasgow Coma Scale score less than 12 are associated with death and/or permanent neurologic deficits. Brain abscesses are uncommon, with only 1500-2500 infections each year, accounting for approximately 1 in 10,000 hospital admissions in the United States. The microbiologic features of brain abscess depend on the initial site of infection. Streptococci (e.g., the Streptococcus milleri group and the viridans group streptococci) are common in pyogenic brain abscesses that result from contiguous spread from the nasopharynx and oropharynx. Pseudomonas species can be seen in extension from otitis media or otitis externa. Enteric gram-negative bacilli are often isolated from patients with an intraabdominal or genitourinary source. Streptococcus species and anaerobic organisms are often isolated from patients with lung abscess. Staphylococcus aureus or viridans streptococci are often isolated from patients with endocarditis. Staphylococcus species and aerobic gram-negative bacilli are often isolated after head trauma or neurosurgical procedures. Citrobacter species (e.g., C. koseri) and Cronobacter species (e.g., C. sakazakii) are well recognized for their capability to cause brain abscesses in neonates. Taenia solium) are well-recognized examples and can be suggested by obtaining relevant social and epidemiologic histories (e.g., cat exposure, exposure to live stock in a high prevalence area, travel, and ingestion of undercooked pork). Cryptococcus species) dimorphic fungi (e.g., Histoplasma species, Coccidioides species, Blastomyces species), and molds (e.g., Aspergillus species, Rhizopus) are associated with immunocompromised conditions, and zycomycetes are associated with poorly controlled diabetes. These pathogens cause brain abscess through contiguous spread (e.g., from oropharyngeal and upper respiratory tract infection), direct inoculation (e.g., after cranial trauma), or hematogenous spread from a distant focus of infection (e.g., in a setting of intravascular infection such as endocarditis and/or cardiac shunt). How can brain abscess be prevented? In patients with congenital heart disease and cardiac shunts, antimicrobial prophylaxis to prevent intravascular infection such as endocarditis will help in preventing the development of brain abscess (Table I). The optimal treatment of brain abscess, which includes the duration of antimicrobial therapy and need for surgical treatment, is currently determined individually based on causative pathogens, size of the abscess and response to treatment.